This Christmas Candles DIY is not only really cheap and pretty but it also makes a great gift for friends, family or teachers alike. It looks simple yet festive and has the scandinavian vibe we all love so much these days. Your kids will love helping you create this cute decoration for the holidays or spend an evening with your besties crafting away, sipping on some tea with christmas songs playing in the background. I garantee you will be in the holiday spirit in no time. And honestly this DIY tutorial couldn’t be easier. Wrap the gold wire around the candle to meassure the size you will need. Add an extra inch just in case and clip it off using wire cutters. Use one end of the wire to poke through the side of the orange slice and poke it out again on the opposite site so the slice will be wrapped on the wire. Prepare about three to four slices like that (depending on the size of your candle) on the same wire and wrap it around the candle. Twist both ends together to secure the wire. Do the same with the apple slices. If you want to use cinnamon sticks you’ll first have to cut them into smaller pieces and than just stick the wire through them as you would through tried pasta. It’s a lot easier to do than the dried orange and apple slices and adds a nice festive touch. Are you looking for a geeky gift? Make a Concrete Death Star! I would recommend to work with at least two different types of natural material as just one wrapped wire looks kind of boring and like it’s missing something. 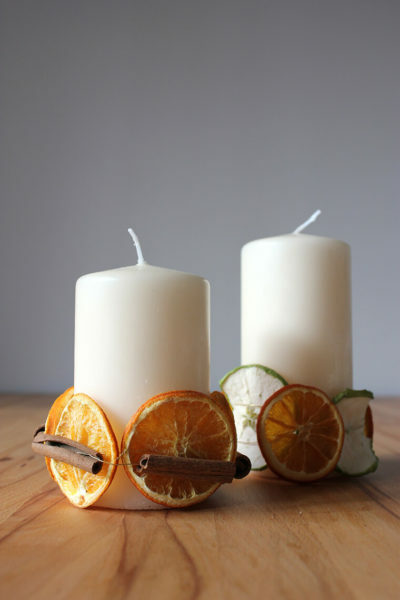 For one candle I used cinnamon sticks and orange slices while for the other one I went with apple and orange slices. I think both look great and add a nice variety. 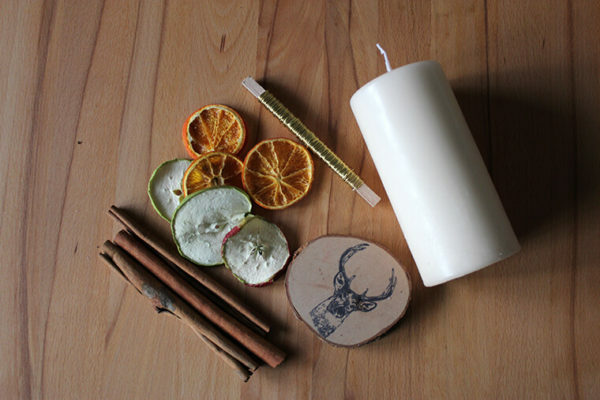 I placed my Christmas Candles DIY onto small wood slices but you can also just place them on a nice plate with some christmas bulbs around or twigs. Feel free to decorate them however you want and get creative! Definitely recommend placing them on something due to wax dripping down. I love how clean and natural it looks but it still feels like holiday candles. How do you like to decorate for the Holidays?